As you kiss under the mistletoe, be mindful that the plant was once said to have mystic properties. Likewise, holly was considered sacred by pagans. Because of these beliefs, a sixth-century Catholic bishop banned Christmas foliage as being ‘dangerous and heathen’. Savouring the thought of being dangerous and heathen, I seek out Lucie Allison to ask about the wreaths she makes. 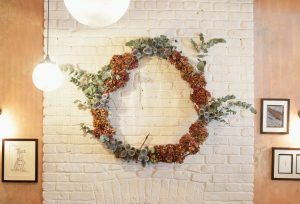 If you were fortunate to have eaten in Odettte’s last December, you would have noticed her wreaths. You could not miss the one which impressively filled the entire window. Doors in Primrose Hill suddenly become a lot more cheerful at this time of year when Lucie’s wreaths adorn so many of them. Mary Portas is a fan and annually has one on her front door. The bedroom opens out through French windows into a garden where Lucie usually works on weaving together her materials. But being the time of year it is, it’s cold, so the whole process has migrated into the bedroom. The smell is the first thing. Lucie uses foliage rich in oils, such as rosemary and eucalyptus, to provide the basis of the wreath. Then come cinnamon sticks, pine cones and dried orange; and all I want to do at this point is settle down by their log fire with a glass of mulled wine. They look visually appetising too. Lucie raids her own garden and those of friends for hydrangea heads, vine stems, sage and pine. Every October she travels to her home town of Berwick and comes back laden with thistles, which she and her mother Maggie gather halfway down a cliff, and allium heads. As well as the quality of the raw materials, the vital ingredient in Lucie’s wreaths is her unique flair. You see it in their home, which has walls painted bright, vibrant colours and antique Swedish furniture and rugs about the place (Bob is an antiques dealer). Lucie herself dresses in her own quirky vintage style, and the wreaths seem to be an extension of her. They’re all unique, with some having eucalyptus leaves spiralling out from the circular frame like an animated Catherine wheel, or allium heads sprayed pink and green (my favourites) which gleam out from a door or wall. The final element, which is Lucie’s touching trademark in many of her wreaths, is a little robin. Before having children, Lucie worked at sourcing antique textiles for designer’s collections. She would seek out inspiration for Kate Moss, John Galliano, Donna Karan and Dries van Noten. 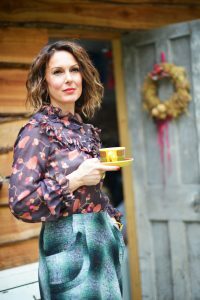 She also had a studio in Bloomsbury and designed her own collection of fashion accessories for department stores in London, New York and Japan. Previously she had studied at Manchester University’s Art School where she spent time with the designer Thomas Heatherwick and eventually moved to London with him. After volunteering to make wreaths for her children’s school fair at St Paul’s, Lucie was surprised how popular they were. Since then she makes thirty every year for the fair, and they always sell out quickly. 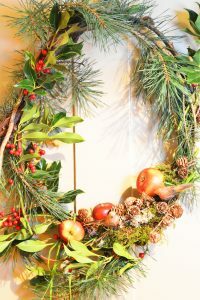 We chat a little about decorative all-year wreaths: how harvest wreaths were traditionally hung to protect against poor crops, and that Ancient Greeks used them to attract fertility. Etruscan rulers wore them as crowns, Romans used them to represent rank and status, and athletes in the early Olympic Games were crowned with laurel wreaths. The circular form represents eternal life, and wreaths at Christmas suggest welcoming cheer and festivity with the evergreen leaves giving a promise of spring. If you’d like to have a go at making your own, Lucie will be running a wreath-making workshop on Thursday 8 December in St Mary’s church, 8-10pm; and then further workshops every Wednesday evening continuing into 2017.